Insider squabbles, flapping lips: Is Austin's Formula 1 U.S. Grand Prix in trouble? There have been mixed messages concerning the U.S. Grand Prix in Austin this week coming from the mouths of people who should be “in the know” about the event. As the year’s racing schedules near the end, the “silly season” begins and rumors start to fly. Most concern driver’s contracts, racing sponsors, technical partnerships, etc. ; but, the rumors also include racing schedules and circuit contracts with the sanctioning bodies. Yesterday at the beautiful new Palmer Events Center in Austin, Texas, media from around the world and dignitaries such as Senator Kirk Watson, Representative Eddie Rodriguez, Austin Mayor Lee Leffingwell, and Mayor Pro Tem Mike Martinez were poised and ready. We were all expecting a big announcement from Tavo Hellmund and the Formula 1 United States team. We got quite a bit more. Hellmund, Red McCombs, and emcee Bob Varsha of Speed TV got things rolling by introducing the new name of the track - “Circuit of the Americas”. Hellmund later ‘shifted gears’ as easily to and from beautifully articulate Spanish as he must have when flying around some of those storied European road courses in his racing days. Latin-American fans will surely appreciate his fluency. For months, Tavo Hellmund has been promising that the new racing facility being constructed outside Austin in Elroy would be more than a place to watch race cars go fast. After the naming introduction, Hellmund, President Steve Sexton, and major investors Red McCombs and Bobby Epstein detailed a site plan that includes major initiatives in Business, Education, Entertainment, and Sports. Hellmund made the point as well that the facility under construction is really more like a small city than a mere sporting complex, and is designed as an international tourist destination unto itself. There are plans for a new 40,000 square foot Conference Center and fourteen 2-story, 3600 square foot Executive Meeting Suites with elevators, kitchens, upstairs office spaces and downstairs meeting spaces in each that can hold 60 to 75 people. Plans also allow for public spaces for events, seminars, and conventions, including a banquet hall and commercial kitchen above pit lane for seminars and receptions. Talks are reportedly ongoing to develop an unnamed hotel, potentially with related retail property. The Grand Plaza on the track side of the Boulevard is a live music and event venue with capacity of up to 35,000 people. Its scenic hilltop is situated between Turns 15-18. Could music acts be scheduled before and after high-profile races to diffuse traffic congestion? Hellmund also again dropped a hint that the larger Festival area across the Boulevard could be slated for even bigger music events down the road. To give the facility a centerpiece and help draw visitors to the track year-round on off-days, the firm of Miro Rivera Architects has been commissioned to design a 22-story tower near the center of the facility, which will house a museum in the bottom portion. Red McCombs restated his vision of the Circuit of the Americas as a Human Performance Testing Center. Featured prominently in the discussion and promotional videos were Running & Bicycle Racing events. (On an editorial note, I believe moves like this and the creation of the music venues are brilliant, and are key to public acceptance and to burning this Circuit into our collective consciousness as a place we go for things other than motorsport). As Bobby Epstein outlined, Circuit of the Americas has reached out to and made Education Partnerships with Del Valle Independent School District, Texas A&M University, St. Edward’s University, and Huston-Tillotson University. Notable among these is the curriculum that Del Valle ISD has created based on the AT&T Williams F1 Team’s “Race to Learn” program. In addition, Circuit of the Americas plans to create 400 “Hospitality Training Opportunities” for DVISD students. Hellmund and Epstein also hope to announce an agreement with the University of Texas very soon. "Circuit of the Americas is almost like our district's home field…It is going to serve as a source of learning and inspiration for generations of students who attend our schools." Hellmund indicated he had hoped to announce a deal with a major automaker that would create an on-site testing center for passenger vehicles at the facility. He stated that instead he hopes to announce a deal by the end of the summer with not one manufacturer, which has been completed, but two. Tavo Hellmund introduced two more Texas sports celebrities - Moto GP star Ben Spies and former 500cc World Champion Kevin Schwantz, who promptly announced a 10-year contract with Moto GP to host Grands Prix in Austin at the Circuit of the Americas beginning in 2013. No date has yet been announced, and it has not yet been determined how many U.S. Moto GP races there will be at the other U.S venues - Laguna Seca and Indianapolis Motor Speedway - from 2013 forward. The formal press conference was followed by a simple Q&A session. I did my journalistic duties, recording audio of interviews with Red McCombs, Steve Sexton, and Ben Spies, trying to make sure we had photos of all the right people, and tweeting this and that. Fast forward to the media bus tour of the construction site in Elroy. This is where it gets weird. Long story short: I and a few other folks drove our own vehicles and got out there after the bus went up to the top of Turn 1, so it was decided that we could drive up in carloads escorted by an authorized vehicle...and I got to go first. On the outside I was happy in that “Oh look. I just found a $5 bill on the sidewalk” kind of way. On the inside, though, I was running around screaming maniacally like Jerry Lewis in, well…any of his movies. I took some video along the way up and down. You can all see how steeply we started climbing up the straightaway as we passed the Start/Finish Line. It got steeper and steeper, and as we stopped, still in reporter mode on the outside, I calmly said something like “Here we are at the top of Turn 1”. I had just driven in my own car before all my friends and before every F1 racer to the top of Turn 1 at the Circuit of the Americas, a turn that promises to be one of the most celebrated, analyzed, and photographed in all of motorsport for years to come. I can assure you that what I was saying on the inside was something very, very different. To those of us not familiar with Texas politics and government, the permit process has been a bit confusing. Generally speaking, the project has been in phases and several different local governmental bodies have been involved. The obvious players are the State of Texas, Travis County, and the City of Austin. But, there have also been rulings by others including the Austin Environmental Board. Rather than trying to understand, much less explain, all of the maneuverings necessary to get permission to proceed, I will instead defer to one of the officials involved. In order to meet the developer's deadlines, they have requested that a series of permits be issued for this project. The first permits in the series were for the pipeline relocation and the overhead utility relocation necessary for the project. TNR has already issued these relocation permits. The permit that is currently under review is for site grading. The site grading permit includes temporary erosion controls, site grading, installation of public water and wastewater mains, installation of drainage conveyance structures to route the upstream drainage to the water quality/detention features and installation of water quality and detention structures. The developer is seeking a variance to the County's requirement that a Conditional Letter of Map Revision (CLOMR) be obtained from the Federal Emergency Management Agency (FEMA) prior to this issuance of the site grading permit application. The December Commissioner's meeting had agenda item 9.B that considered the CLOMR variance. The variance was accepted by a 4 to 1 vote, thus clearing the way for the issuance of the site grading permit. What is unclear to me is whether or not the permit has actually been issued. I could not find this permit information listed in either the County's permit database or the City's. Perhaps someone more familiar with local government documents could help me out. I would greatly appreciate any help I could get. One of the remaining hurdles to be crossed between the F1 developers and the AHJ (Authorities Having Jurisdiction) is the traffic plan. Everyone understands the need to move all competitors, vendors and attendees to and from the site safely and in a timely manner. It is also understood that the site must be prepared for a major incident that impacts the group as a whole. A plan must be in place that satisfies these concerns and has a reasonable chance of managing any conceivable probability. The plan must also insure that the event will not be a commercial failure due to undue delays that may sour the attendee’s personal experience and impact the future attendance at the event. The last development permit that will be required for the site will include track paving and details, vertical building construction, driveway and parking lot paving, and private water, wastewater and electric services. Prior to issuance of the final site development permit it is expected that a Roadway Agreement will be brought to Commissioners Court that will require the developer to improve Elroy Road to a four lane road and widen and raise the existing bridge in order to accommodate the volume of traffic to and from events at the track. The AHJ needs to have proposals mooted to them that can be approved without taking any gigantic risks. The traffic proposal previously submitted by FTP did not satisfy the staff of the AHJs, did not make anyone in Government comfortable, and basically was a “do nothing much to the roads” plan. The plan suggested that traffic management, mainly done via shuttle buses, contra flow, bicycle access, on-site camping, etc. would be all that is necessary. It is clear, to anyone who is reasonably well informed, that this will not work. Instead, the real issue is who will pay for the necessary improvements. Will the developer pay for the improvements, or will the public pay for the improvements? It is clear that the County Commissioner's Court expects the improvements to be paid for by the developer. I do not intend to get into a discussion about the philosophies regarding public funding for private development, but instead will look at the issue from a practical point of view regardless of who pays the freight. In my opinion the roads that immediately surround the F1 site are inadequate for the demands of a major racing series. I cannot cite any studies, but I have been to racing events in six countries and more than 25 locations in the US. I have driven around the site, looked at the existing roads, and I recognize that the road infrastructure is inadequate. It barely satisfies the current daily demands. Improvements are needed and the Commissioner's Court has some demands. Overall, Travis County agrees with the basic assumptions, routing of vehicles, and the use of contra-flow lanes included in the report. The one issue that Travis County does not agree on is the mixing of shuttle traffic with vehicular traffic on Elroy Road. We believe that the shuttle operations will not be successful unless shuttle vehicles have a dedicated lane of travel. Furthermore, Elroy Road will need an additional travel lane for emergency operations access. Currently Elroy Road from McAngus Road to the northern access point of the site is only two lanes with no shoulders and the submitted traffic plan proposes using both lanes as contra-flow operations with no lanes available for shuttle services or emergency operations access. Thus, Travis County believes Elroy Road from McAngus Road to the northern access of the site needs to be widened to a minimum of 4 lanes. This work would include the widening of the existing bridge structure on Elroy Road that spans Dry Creek. The approximate cost for widening Elroy Road from a 2-lane roadway to a 4-lane roadway is $6 million. Travis County staff believes the cost associated with widening Elroy Road should be born by the developer. It would appear that acceptance of this demand is a requirement to gain approval to proceed. TxDOT was going to already repave FM 812 on the southern side of the site, and we've talked with TxDOT and TxDOT has agreed to re-stripe that road, which is a two-lane road, two nice wide lanes with shoulders to re-stripe it to where we can actually use it as a four-lane roadway when we need to. It will be striped as a two-lane road with wide shoulders, but when you need to for the site, for the race, we can actually use all four lanes. That bit of information makes a great deal of impact on the feasibility of the entire traffic plan. If the developer does agree to widen Elroy Road, and TxDOT executes their existing plans for FM 812, many of the traffic concerns will be solved. The Commission also agreed to consider any of the public funding solutions available including public improvement districts and public sports authorities. But, the immediate response required is for the developer to assume the costs of improvement to Elroy Road. Maybe he can recover the costs, maybe not. But, in order to keep this project going a decision much be taken very soon. To summarize all this bureaucratic fog, I would just say this: if the developer agrees to the improvements to Elroy Road the permission process would be complete. I suggest they accept the Commission's recommendations and get the construction moving. On Tuesday, December 28th, I and several other members of the facebook group Friends of Formula 1 Austin (including admins. Vance Facundo, Matt Sager, Tim Woods) had the opportunity to sit down with Formula 1 United States CEO Bruce Knox for a one and a half hour conversation. The meeting was arranged by Ali Putnam, an account executive at 3 Point Partners. 3 Point Partners provides consulting services in the areas of media, communications, community outreach, and government relations. Thanks to Ms. Putnam for making our visit possible. As you may already know, due to my professional career as a construction project manager, I have an avid interest in the nuts and bolts of project development and execution. I also have a fanatical interest in formula 1, and the Austin project has given me a great opportunity to combine my professional life with my avocation. Having been to Grand Prix events in six countries, I have a pretty good idea of what goes on during a Grand Prix, and having been in construction management for 30 years, I have a pretty good idea of the difficulty associated with completion of a project of this complexity. Public safety is a subject that has been mentioned now and again at various commission meetings and in the media. The commissioners have a serious interest in public safety and need their questions answered. Some members of the public who oppose the circuit, however, are using the subject as a scare tactic. The floodplain was discussed, the pipelines were discussed, the pollution was discussed, the noise was discussed, and public safety was discussed. Some of these subjects have been put to sleep. The HVL and natural gas pipelines were one of the first subjects that made the headlines. FTP and their specialists met with industry representatives and devised a plan that would eliminate any concerns about the safety of the pipelines. The end result is that the pipelines will be relocated and the specification in use today will bring a much safer installation. The next concern was the floodplain. Citizens and commissioners alike were worried that the construction and other developments at the site would worsen the flood probabilities. That is a fair concern, but once again the specialists have found a way to engineer these concerns away. One of the remaining hurdles to be crossed between the F1 promoters and the AHJ (Authorities Having Jurisdiction) is the traffic plan. Everyone understands the need to move all competitors, vendors and attendees to and from the site safely and in a timely manner. It is also understood that the site must be prepared for a major incident that impacts the group as a whole. A plan must be in place that satisfies these concerns and has a reasonable chance of managing any conceivable probability. The plan must also insure that the event will not be a commercial failure due to undue delays that may sour the attendee’s personal experience and impact the future attendance at the event. The City Council tabled an agenda item scheduled for the Dec. 14th meeting, an item that was meant to address the F1 traffic plans. The item was moved into the New Year, but the exact date has not been determined. One may ask why that happened. In the opinion of many observers, the answer may be the absence of a dedicated project management effort, an effort that considers everything from circuit homologation to hot dog sales. Tilke may be too focused on the details of what goes on inside the fence to manage the things that happen elsewhere i.e. the City Council, etc. 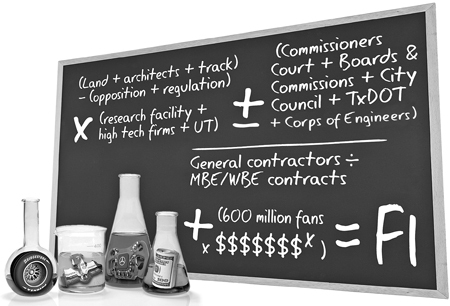 Building a formula 1 facility and promoting an F1 event is a very complicated matter. Back in May when Bernie told the world that Formula 1 was coming to Austin, we were all quite excited. Especially exciting was the prospect of having the first “real” F1 circuit in the US since Watkins Glen. But soon after the initial party was over, there was the realization that a very difficult task lay ahead. When sober minds started considering all of the things that must be done to pull this rabbit out of the hat, the exhilaration turned to a measured panic. The processes involved in managing a project of this nature are well understood. All projects have the same elements, but some projects have very special circumstances that must be considered. I have been following this closely and there are some aspects of this project’s implementation that I am very comfortable with, and some that I am not. The fact that Tavo Hellmund and his group Full Throttle Productions (FTP) secured a 10 year contract with Formula One Management (FOM) is in itself a remarkable accomplishment. Several years of preparation preceded the announcement, and the success is a testament to Tavo’s hard work and perseverance. He used his contacts in F1 to his advantage and never stopped pursuing his dream in spite of the odds against him. I know Vance Facundo and Tim Wood from Friends of Formula 1 Austin, and I am a supporting member of that group. They have given me permission to discuss this subject with you. I have been promoting the race through my blog and forum. I have been to F1 races in 6 countries, have contacts within F1, and I concentrate on the technology and business of F1. I provide technical support and F1 education to the Austin efforts. Back in September a associate of mine sent a detailed traffic study of the Austin project to Red McCombs' group. It was developed by his risk management associates at a firm near Dallas. The firm focuses on risk assessment with regard to major projects and events. I will not mention the firm by name as they are not currently seeking a commercial relationship, but instead have a sporting interest in the event. Five months ago, Austinites heard the surprising announcement that Formula One motor racing is coming to town. With the first major council vote scheduled for Nov. 18, the developers, partners, and local government are beginning to tackle the complicated and potentially daunting reality of turning a big dream into a concrete reality, starting with the construction of a purpose-built racetrack. But the track is only part of what's now planned for the 900-acre tract in southeastern Travis County, and the sum of what's proposed is quite ambitious. As Formula One United States Grand Prix Chair Tavo Hell­mund said at a recent luncheon of the Real Estate Council of Austin, "Formula One is really just the crown jewel of what this multifunctional facility's going to be and what it can do for this area." So far, a lot of the talk – including most of the satirical commentary – has placed the Monaco Grand Prix as the frame of reference. Monaco has been a mainstay on the grand prix calendar since 1929: A street circuit, it sends drivers hurtling across the length and breadth of the tiny principality. The glamour, the sparkling seas of the Mediterranean, the ancient architecture: In fact, it's hard to imagine a location less like what's planned for Austin. The more likely model is the home of the British Grand Prix, Silverstone Circuit. Situ­ated in a rural area, surrounded by small villages, and within driving distance of the nearest city, Silverstone has a lot in common with Elroy, the unincorporated community southeast of Austin that will house the F1 track. Even the road situation is similar: The M1 motorway, the UK's main north-south arterial, sits about 10 miles east, and the track site is accessed by a smaller dual carriageway leading to a couple of small rural service roads. All in all, that's much like the situation in Elroy, where the 900-acre site lies next to the still underused Highway 130 toll road and between two smaller access roads, FM 812 and Pearce Lane. The Austin site arguably has better airport access: Austin-Bergstrom Inter­na­tion­al Airport is only seven miles northwest of the site, compared to a 50-mile drive from Silverstone to Birmingham Airport. The first phase of development, including construction and design of the track and support facilities, is expected to cost about $250 million, the investors said. Previously, Austin Formula One officials said the 3.4-mile track would cost $180 million, but hadn’t said how much it will cost to build the direct-support facilities, which engineering plans show would be more than 300,000 square feet. “We have the money put together,” Weaver said. Epstein — whose companies manage assets worth more than $1 billion, according to filings with the U.S. Securities and Exchange Commission — said it is easier to finance the project now than before. Apparently Epstein, of Prophet Capital Management, and Rad Weaver, director of Business Development for Red McCombs Enterprises, have been quietly working behind the scenes to finalize the arrangements. This is good news for all of us supporters of the race. The joint land-use committee (City of Austin, Travis County, and State of Texas) submitted a lengthy set of questions to the promoters of the Austin F1 event, Full Throttle Productions. These are routine questions that must be answered before permission can go forward.The questions deal with transportation, emergency response, the environment, and the existing floodplain. This is not bad news. The committee has put their combined concerns into one document and that helps the promoters to organize their response. Many of these questions have already been answered by the engineers, particularly the onsite issues, but none of that has been formally submitted to the authorities. The formal response is a couple of weeks away. Their response to the traffic issues are the biggest unknown at this point. The committee wants an analysis of improvements needed in an eight mile radius of the site, and that is well beyond the scope of the promoters. This radius includes many of the highway-to-highway intersections that are clearly the responsibility of the State and Federal governments, but traffic analysis will be provided. It is expected that Full Throttle productions will provide funds for road improvement in the direct vicinity of the circuit, but it is doubtful that they would fund major highway improvements to State and federal highways many miles away. 1. What are the applicant’s thoughts on how to handle and fund traffic control on local streets before, during, and after events? When is it expected to have an on-site and off-site transportation plan finalized? 2. Describe the proposed locations where the site will be accessed from the surrounding roadway network. Has the applicant considered increasing the number of access points to the site? 3. Has the applicant set aside funding and a schedule for improving offsite roadways? 4. We understand the site plan to be conceptual in nature at this time; however when can we anticipate that a final site plan will be available?